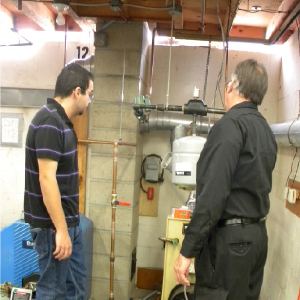 The HVAC/R teaching staff is dedicated in the teaching and hands on instruction of the student. The students will learn both from textbooks	and	from	shop	projects. Students	will	also	get	the	opportunity	to perform tasks throughout the school as they arise. The course is structured to adhere to the schools Mission Statement. The	HVAC/R	field	is	in	high	demand	and	students	will	enter	the	job	market	with	many	opportunities. Students	may	also	decide	to	continue	on	with	their	field	and	attend	trade	schools	or	colleges	to	receive	a	degree	in	the	HVAC/R	field. Students enter the shop in tech awareness and are introduced to piping	and	electrical projects. They are also introduced to the basics of refrigeration. Junior	year	focuses	on	Commercial refrigeration. Related classes learn what they need to know to work in the commercial refrigeration world. Shop work reinforces these lessons with	constructive	projects	related to commercial refrigeration. Students learn and take their 608 Universal EPA lesson. The students are challenged with	many	electrical	projects	as	the sophomore year focuses on Electricity. The students learn from the Russell Smith book Electricity for Refrigeration and Air Conditioning. Senior year focuses on heating. Students learn in class and in shop about boilers and furnaces. Students pipe in their own boilers and learn about set-up and operation.